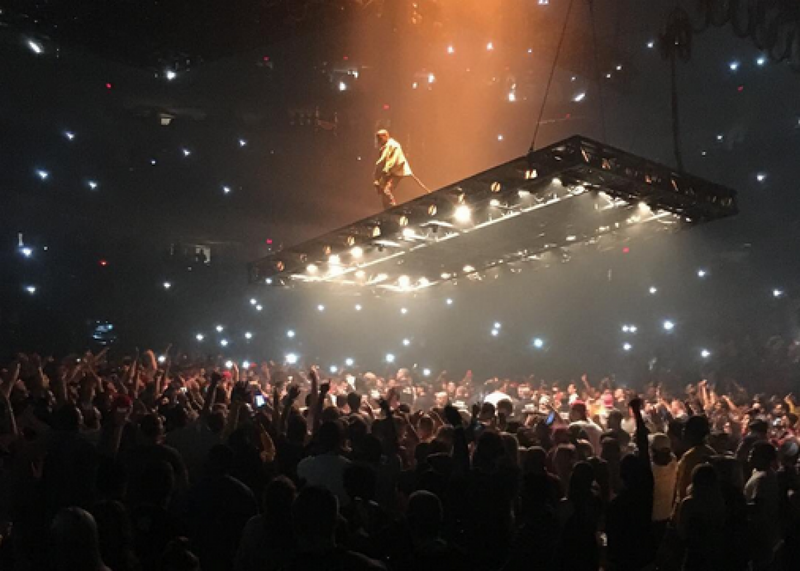 Kanye West’s Saint Pablo tour has a floating stage. This is a god’s dream. But why raise the bar when you can raise the whole stage? That’s what West did on the first night of his Saint Pablo tour on Thursday, debuting a new stage setup that featured no stage on the floor but a giant one in the sky. The floating stage came as a surprise to fans, who at first thought maybe there was no stage at all. Kanye West was flying up in the sky as the crowd went crazy below. Not that he wasn’t concerned with safety. For much of the concert, he was tied to the stage by an elastic tether so that that the stage could tilt in all directions toward the crowd without him falling off. West isn’t the first musician to move around the arena on a floating platform, of course. Small floating platforms—which allow artists to get more up close and personal with even the furthest reaches of the arena—have become a regular part of arena and stadium tours, from Taylor Swift to Drake. On Motley Crüe’s recent farewell tour, Tommy Lee even took his drum kit throughout the arena on a “drummercoaster” called (I’m not making this up) “the Crüecifly”—before he got stuck upside-down during their final show. But as far as I can remember, no one has ever raised their entire stage into the sky, without so much as touching the ground the entire show. After the spaceship and the mountain, it was unclear how West was going to follow himself, but judging from early reactions he did it again.